Remember grade school when you sent multiple valentines around the class? Well this month was Valentine’s Day and we were imagining, if we could peek into other people’s mail, what kind of valentines we might discover that various of our New York City communities might be sending to other of our various New York City communities in recognition of the affinity they have that comes from having certain things in common. With whom do we envision communities might share their hearts? We envision that they might share them with other communities that have the same interests at heart. Here are our thoughts, with respect to the communities in the different boroughs of our city. 1. South Bronx and Yankee Stadium. Up in the South Bronx the community is sitting with unreplaced parkland. Their parkland was taken to build, at substantial taxpayer expense, Yankee Stadium. 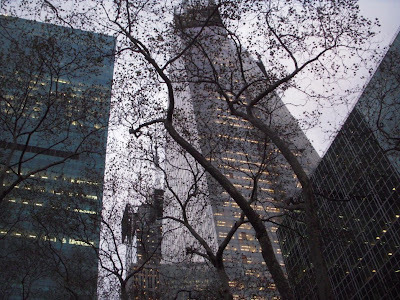 Mayor Bloomberg focused on a not-so-sweet suite deal that would not benefit the public. It seems to us that the community might want to send out empathic valentines to other communities whose community board members where replaced by borough president action because community board members trying to protect their community voted against a destructive project. They might want to send out valentines to other communities beleaguered by stadium and arena finance scams that disregard the interests of the community. 2. 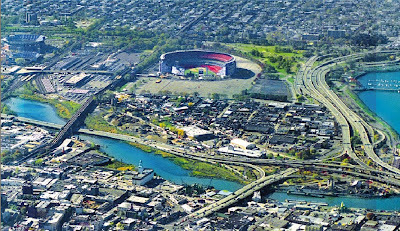 Willets Point & the New Mets Stadium. The Willets Point community might find itself sending a valentine back to the South Bronx community. The Willets Point community, next to the new nontaxpaying Citi Stadium which just replaced Shea Stadium, is now under threat of having eminent domain used to eliminate is bustling taxpaying businesses in a questionable move to give a huge 75 acre development monopoly to a single developer. The community might want to send valentines to other communities faced with the abuse of eminent domain as swaths of acreage are turned over to single developers with whom government is collaborating to give special benefits. Valentines might go to communities such as Prospect Heights and Fort Greene where Atlantic Yards is proposed, and to West Harlem (Manhattanville) which Columbia wants to own all of for an expansion. Those communities are likely to have holes in their hearts for 20 or 30 years as a result. 3. Destruction of Historic Coney Island. 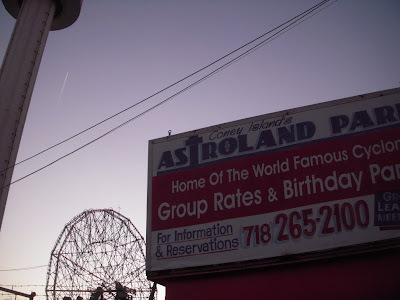 Coney Island is where the community is experiencing the systematic dismantling of its famed amusement area by a developer. Is the developer acting in collaboration with the city government to create this hole in the community that will likely persist for decades? The city is doing nothing to stop it and is pursuing a zoning change that will reward the developer with higher land prices for having removed the amusement park uses and not complied with the city zoning that requires them. 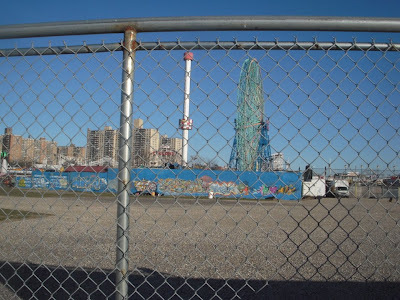 Whether working in conscious coordination with the developer or not, the city probably catalyzed the developer’s destruction when it advertised its receptively to destruction of the Coney Island amusement area. The Coney community might want to send a valentine to other communities with developer-created holes-in-their-hearts induced by developer-sympathetic mismanagement by the city. The holes-in-the-heart of Coney will, of course, be a loss for that community and its unique heritage, but Coney is an area of recreation that should belong to all the city. Its draw should be wide. 4. Development in Brooklyn Bridge Park. Perhaps the Coney community would like to send a valentine to Brooklyn Heights, DUMBO, Cobble Hill and Red Hook communities where a predilection for prioritizing commercial development is being given odd weight as Brooklyn Bridge Park, which should be one of the city’s most important new waterfront parks, is planned and designed. Some strange and fretful politics have been created by the illogical precept that a park of citywide importance should “pay for itself.” Even if one can question what the city can currently afford and whether all of the waterfront area now available for new use should become park, the precept that a city park should “pay for itself” has created confusion and uncertainly about design and management that compound exponentially with the vagaries of an erratic real estate market now on a downward trajectory. As a consequence, there are valid concerns about the unpredictable answers as to just what development may happen. There are equally valid accompanying concerns that the mystery development that finally materializes will be driven by factors other than what normally makes for good urban design and zoning. Then there is a danger that density, driven by the goal of hitting a high profit target, will become too dense. The situation also presents the significant concern that the “park” will be designed and operated as a “backyard” to the residental and hotel development. It needn’t be that way, but the false equation of the precept that “parks must pay for themselves” drives the tension in exactly that direction. 5. Pier 40 on Manhattan’s West Side. Maybe those Brooklyn neighborhoods we just described should be sending some of their valentines to the Manhattan riverside community at West Houston Street. They are struggling with the idea that Pier 40 needs to be self-supporting. More than six years have gone by trying to find proposals that work in this respect. The community board recommended that the Hudson River Park Trust board vote down the proposals that were presented to deal with the deteriorating pier. Instead of wanting something developmentally very elaborate (such as Related Development’s proposal which included putting Cirque du Soleil on the pier) the community wanted something simple and more in line with what it currently has, including soccer fields and other recreational uses. Economic viability being a problem, the trust is now reviewing its plans and suggesting changes to state legislation to make it easier to build something at Pier 40. 6. DUMBO and the Proposed Dock Street Project. Concerned as they are about how the decisions they have been presented with have been bundled together, Manhattan’s West Side Pier 40 community will probably want to send one of their valentines to the DUMBO neighborhood in Brooklyn. Unable for years to get the School Construction Authority to consider building the school they wanted, the community was suddenly presented with a bundled decision opportunity to approve, at greater height, a building it already rejected as too tall in order be granted a school within the building. It must now be skeptically asked what good is a residential building that can only be “sold” by tacking on a school and whether a school shoe-horned into a project is likely to be the equal of a school designed with the community’s needs foremost in mind rather than to coerce it to approve an extra large project it previously rejected. 7. Gehry/Ratner Beekman Tower Blackmail. These kinds of Faustian bargain bundles can also lead to awkward after-the-fact choices. Right across the river on the other side fo the Brooklyn Bridge from the Dock Street project is the Beekman project, another towering project into which a school was inserted as a sales gimmick. 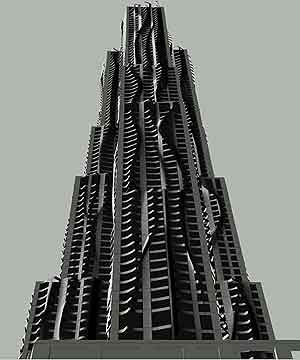 The project is designed by Frank Gehry and looks like what you would get if you sculpted a gothic tower out of wax and then made a quick pass with blowtorch. 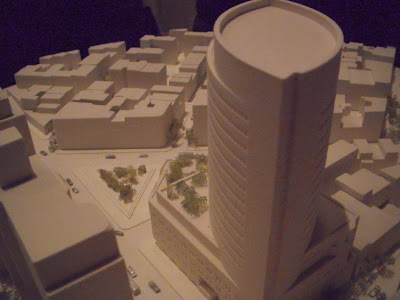 With this project we saw how the tactic of bundling backfired and how the public was hurt when, with construction underway, the developer, Forest City Ratner, blackmailed the public and the community board, telling them they were holding construction of the school hostage for the demanded receipt of extra subsidy. 8. In Red Hook Brooklyn, IKEA, a Park and a Dry Dock. Having a bad development deal forced down its throat might cause the DUMBO community to send a valentine to the Red Hook Community. Lest anyone think that the “bundling” of development decisions is about good economics, keeping the city solvent or making sure that tax revenues flow, one can consider the situation in Red Hook. 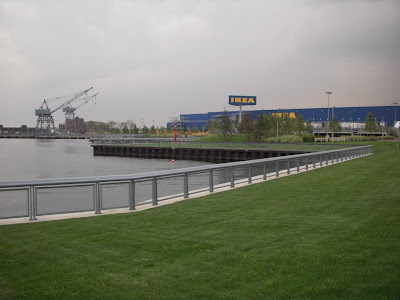 Red Hook got a new IKEA store and an expensive new Michael Van Valkenburgh park. But in order to get these things the community and the city lost a graving dock (dry dock), which the city and its economy sorely need, to create an outdoor parking lot for the IKEA. This resulted in the elimination of high-paying jobs while replacing them with a similar number of much lower-paying jobs. The real tragedy is that, if the IKEA (with its parking lot) was wanted, it was not necessary to sacrifice the graving dock in order to have it. We could have had both IKEA and the graving dock. The city is now looking at spending a billion dollars to replace the sacrificed dry dock. Why was an existing, necessary and productive billion dollar asset sacrificed? We attribute it the city’s reflexive accommodation of big real estate projects and the administration’s failure to value what we have. This was also a failure to value what the community values. 9. The Proposed Atlantic Yards Megadevelopment in Brooklyn: Poster Child For Everything Developmentally Bad. Speaking of destroying what the community values and what is economically of superior value, the Fort Greene and Prospect Heights communities, near the proposed Atlantic Yards, should get a valentine from Red Hook. 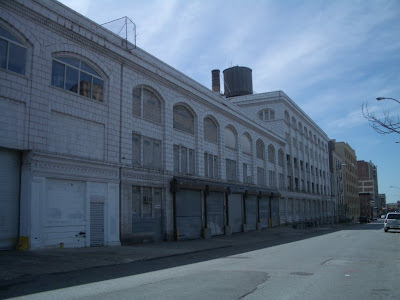 The developer-driven Atlantic Yards involves tearing down worthwhile existing buildings. Some of those buildings, like the Ward Bakery are historic and surpassingly valuable as candidates for adaptive reuse. Others were very recently produced within the last few years by a vigorous and governmentally unaided development economy that the project seeks to quash and replace. The communities near Atlantic Yards will be getting empathy valentines from, and sending them to, almost all the other communities in New York beset by bad development. Atlantic Yards is the one project that is so supremely bad that it is the poster child for virtually every kind of city and state development incompetence and collusive oversubsidization of big developers. Atlantic Yards is an example of what you get when you turn over to a developer all the “public” decision-making functions, telling them they can write themselves a sky-is-the limit blank check. Every decision box with respect to this megadevelopment has been checked in the developer’s favor and none in the public’s. Designed as a maximum subsidy-sponge with a maximum churn, the project is mainly a redistribution of assets in the developer’s favor rather that the creation of wealth or value. 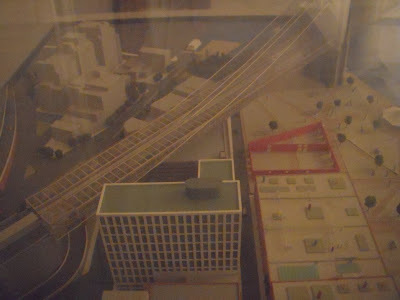 The overscale project involves eminent domain abuse in the extreme. The megaproject is bad design, overly dense and seizes streets and avenues to augment an already indefensible 30+ acre governmentally assisted developer monopoly. Though the developer had a free hand filling in his blank check, ESDC, the lead New York government agency effecting this project, admitted aloud in court Monday that they approved this megaproject without ever weighing the extraordinary magnitude of benefit the developer was bestowing upon himself against the definite harm and, at best, only incidental benefit befalling the public. 10. Eminent Domain Squeezing in Previously Unimagined Density into Central Business Neighborhoods. The Bryant Park neighborhood in Manhattan likely would get a valentine from the proposed Atlantic Yards neighbors. The neighborhood will be experiencing more density than once imagined for it, courtesy of the use of eminent domain to unexpectedly squeeze that density in. Will this previously dense area become more so to an uncomfortable degree? Similarly, more density is coming to Downtown Brooklyn where eminent domain is also planned so that developers who want to build big buildings with bulky floorplates will be able to do so. Like the plan for Atlantic Yards, the density is planned to come with a loss of some of the streets that would help make the extra density more bearable. The streets would not be kept as valuable or reminders of the past the way the streets in the Wall Street area were landmarked and preserved. We could go on. Little of Harlem’s 125th Street might remain after the use of eminent domain in conjunction with zoning that will substantially increase density. 11. 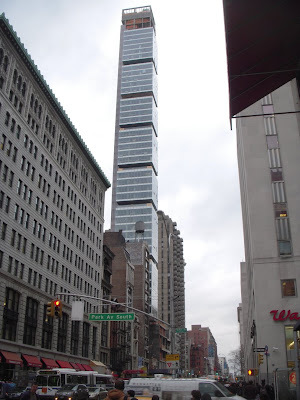 On Manhattan’s East Side, A Dense New Solow Project. Valentines concerning oppressive density will be going back and forth between many neighborhoods. One of the senders and recipients will be Manhattan’s East Side. 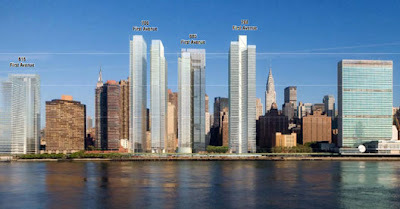 Seven generic-looking straight-up glass towers are proposed to be built along the waterfront south of the United Nations. The density the City Planning Commission allowed with an approved rezoning is probably greater because, even though streets will be reinserted into the grid, those streets were once demapped when a Con Edison generating plant was on the site. That streets once happened to be privately owned is not a legitimate reason to have approved greater than normal density. The 9.8 acres of land is the largest privately purchased and owned tract being developed in Manhattan (compare that to the 30+ acre government-sponsored no-bid monopoly being awarded Ratner in Brooklyn). 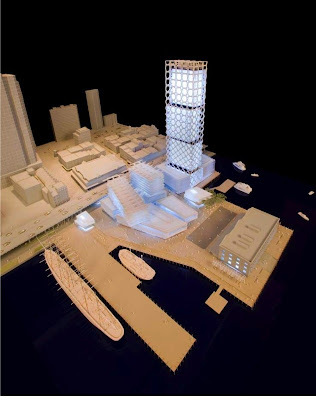 In theory, the immense size of the Solow development was negotiated down from a possibly more immense size by public officials, but the tallest proposed tower at 595 feet, is about 60 stories and 90 feet taller than the United Nations building. The unexcitingly designed neighborhood of new towers is supposed to house about 3,000 apartments and 1.06 million square feet of commercial space, as well as 69,000 square feet of retail. There is good news in that the Municipal Art Society led negotiations to obtain developer cooperation that will continue East Side waterfront access by building a waterfront park and promenade. As the park is such an obvious benefit (almost a “need”) for the neighborhood and its creation will involve public expenditures, why was it so hard to negotiate this? Didn’t the developer understand it was to his own benefit? . . . And this is a Manhattan community that should have more political power and say than most! Still, this grand scheme project may be a hole in the ground for years to come. The developer is now involved in several lawsuits relating to financing and the residents of Tudor City sued to prevent the project from happening. 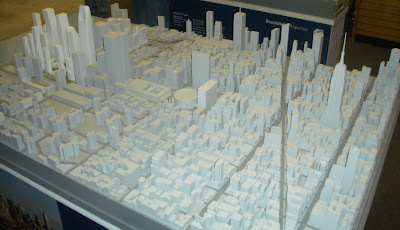 In particular, the community in this area ought to be upset that, in order to approve the unusually immense density for the project, the City Planning Commission adjusted its review timetable to favor review of the developer-driven rezoning proposal rather than the community-sponsored 197-Community Board 6 proposal for rezoning of the area that antedated it. Since the community plan should have receive, but didn’t, preference over the developer-driven plan, Community Board 6 can compare notes and commiserate with Community Board 9 which submitted a community-based 197-a plan to accommodate Columbia’s expansion into West Harlem. . . .
12. Columbia’s Expansion into West Harlem. 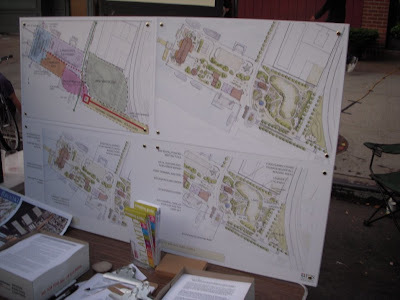 In the case of Columbia’s proposed expansion into West Harlem, the City Planning Commission also followed a review timetable that sped up and slowed down as necessary to favor the Columbia-as-developer-driven plan over an earlier prepared community board-sponsored 197-a plan. Columbia’s own plan involves some highly intricate and odd-explanation reasoning about why there has to be a neighborhood-wide, seven-story-deep basement under the project such that, according to Columbia, Columbia must be granted each and every fraction of real estate it wants to develop in the vicinity over the next 25 or more years, no ifs, ands or buts and with not the slightest little corner clipped off. Columbia probably benefits a lot in its quest in that the other residents and landowners in the neighborhood it is figuratively knocking off the economic up-escalator are not high income. It probably benefits even more in its quest in that people recognize Columbia is a revered nonprofit institution chartered for the high-minded purposes of education and, as they have emphasized recently, health care research. Therefore people have been eager to accommodate and subsidize the “venerable” institution by bestowing upon it the right to eminent domain windfall. Columbia is being subsidized by allowing it to acquire real estate at extra-low prices by this exceptional special means of acquisition. The West Harlem community at whose expense Columbia is being subsidized should be sending a valentine to the community of Greenwich Village where, similarly, a revered nonprofit chartered for high-minded purposes, St. Vincent’s Hospital, has persuaded people that it should be subsidized by being allowed to acquire real estate at extra-low prices in other than the standard way. 13. The Rudin/St. Vincent’s Real Estate Deal. St. Vincents and its real estate partner, the Rudin Organization, are being allowed to sell off a portion of the Greenwich Village Historic District in order to replace landmark buildings with buildings of substantially greater density than could otherwise be built within the historic district. Just like Columbia, the nonprofit St. Vincent’s (and its for-profit real estate developer partner Rudin) argues that it must be allowed to develop precisely the real estate it says it needs and no other real estate, no ifs, ands or buts about it. And of course, just like Columbia, doing so will result in the greatest real estate subsidy for the “venerable” institution. The Rudin/St. Vincents’ proposal is quite a shell game. It involves swapping around different uses at different properties at several sites to play its magic tricks of garnering more density while putting asunder a portion of the historic district. The hospital claimed that due to hard times it had fallen upon and poor original planning, buildings built only 24 and 21 years before (with special planning accommodations) need to be torn down on an accelerated basis. Don’t, however, take your eye off the resulting increase in density. Like so many other proposals, the Rudin/St. Vincent’s proposal feinted by starting out with a proposal of something far worse than what they intended. This way politicians could say that they had negotiated “improvement” over what might have come to pass. The historic Greenwich Village neighborhood that is having these tricks played upon it should send one of their valentines to the downtown South Street Seaport Historic District. 15. 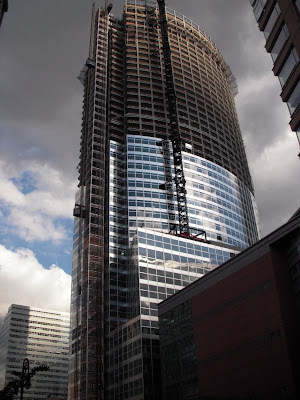 The Pre-eminent Master Plan Abandoned: New Goldman Sachs Tower at Battery Park City. For those concerned about design being forced to take a back seat (or just throwing design away) when the goal is to accommodate a special freebie deal to squeeze in extra density where it was never previously supposed to go, send a valentine to the community of Battery Park City. No community or neighborhood built in NYC within the last half century has been as renowned as Battery Park City for the exquisite perfection of its master planning. 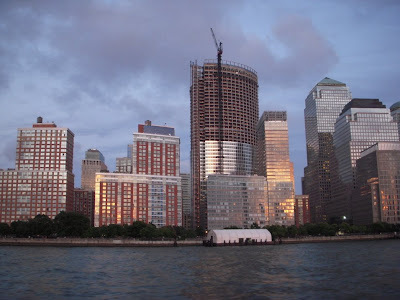 That is why when you visit Battery Park City it is immediately apparent that there is a one giant new overbearing building that doesn’t fit in with the orchestrated family of buildings that constitute the rest of the community: the new Goldman Sachs tower. The marvelous balance and beautiful interplay apparent everywhere else in the community is immediately and obviously missing when it comes to the jarring building that was specially subsidized for Goldman. You know instinctively that the renowned Battery Park City master plan was abandoned in order to dump the building’s density into the community. Could the extra new density of the building have been accommodated if properly designed to fit in? The answer goes unaddressed because it looks like no one even tried. It is not clear that anyone tried to exact much of anything from Goldman when Goldman and our public officials were sneaking this one in. 16. Rebuilding at Ground Zero. Before the Goldman building was built, Battery Park City was always considered to be a job exceptionally well done, from which others could learn. Here is something that should engender an exchange of valentines: When it comes to sadness that these immediately present and obvious neighboring Battery Park City design exemplars were ignored, we have pointed out that the rebuilding at Ground Zero also falls short of learning any of the lessons evident from the quality of design at Battery Park City. Ground Zero serves as an example of how, when actually given the often coveted opportunity to replace an only recently designed section of the city (South Street Seaport opened in 1983, the ribbon cutting for the Twin Towers was only ten years earlier, April 4, 1973), our current city officials are not inclined to take advantage of the opportunity to learn from past mistakes so as to produce significant improvement even when there is enormous impetus to do so. 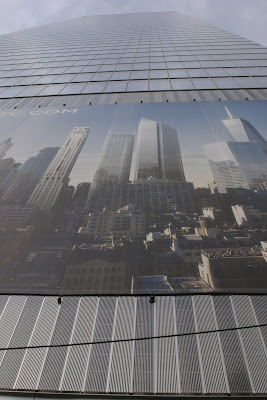 The redevelopment of Ground Zero is not one of the worst things happening in New York City. It is probably one of the best, but one would expect that with such a high profile do-over we would get the very highest possible urban design quality. You would expect that the design would learn from, reflect, match or exceed and integrate with the best design in the adjacent Battery Park City. Instead, we are getting something where the design is not of the highest quality or as exceptional as it should be. 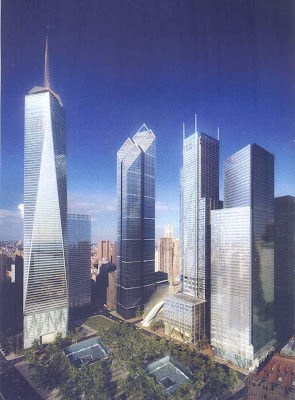 The new Ground Zero design is too much a bunch of conventional straight-up towers, some with unfortunately intimidating fortress-like bases, zooming skyward for maximum density. Qulaity of the design aside, the filling of this hole in financial downtown is proceeding with aching slowness. Why so slow? Partly because of efforts to accommodate real estate owners by struggling to squeeze in maximum density, notwithstanding the creation of new public space, an improved transit hub and the restoration of desirable previously removed streets. 18. Christine Quinn’s West Side of Manhattan: Hudson Yards and a Lot Else. Want to send a valentine to a community that might appreciate that you get less when you send in (or allow) a developer to do the job or jobs that government should do? The Penn Station neighborhood can send a valentine to the part of western Chelsea where the Hudson Yards project is planned to go, . . . someday. The developer has just been given an extension on making payments and, accordingly, it needn’t proceed with the project now. The extension is because the economic times are tough. If that is the reason for an extension it could be quite some time before anything starts there. A lot of economists are saying they expect things to be economically tough for at least five years. Things have come to an unfortunate standstill now, but this standstill didn’t need to have occured. It is directly due to a fateful decision public officials made to relinquish public development responsibilities for the 26 acres in order to put them in the now inert developer’s hands. Government had two options for developing the 26 acres and many argued the wrong choice was made. Government could have prepared the 26 acre site for development itself at it own expense. It could then have offered individuals sectioned-off development lots to the various highest bidders ready, willing and able to proceed with development immediately. Those in favor of proceeding this way argued, correctly, that this is the way that government would have received the greatest recompense for the publicly owned railyards that are to be developed. That greatest recompense would be calculated after netting out the government’s expenditures to prepare the site. Furthermore, the value of the site is currently escalating terrifically because the government is busy constructing an extension of the #7 subway line to the site. Instead, our local officials decided to have one developer take and prepare the entire site. For a variety of reasons this lowers the amount the public will receive for the 26 acres. Among other things it forces the developer to bear risk associated with when the new subway extension might actually be in place to benefit the site, a risk which could be more appropriately borne by the government. It also means that it is more difficult for the developer to undertake the financial carriage of the substantial cost of site preparation when the developer can’t reliably factor the timing and amounts of their recoupment when they actually complete commercial development. All of this uncertainty must be reflected in a lower price. And now, in addition to that lower price, it is also reflected in the developer’s delay in proceeding and in making payments for the site. Ironically, one reason the unprepared site was sold at a lower purchase price was so as NOT to have to postpone receiving these payments. If the government (as opposed to a private developer) was preparing the site it would not be necessary to postpone the site’s preparation at this time. Site preparation during the current economic downturn might even be cheaper. As it would be a public work, it would arguably be in the running for funding through federal stimulus, an important part of that being that the prepared parcels would later be bid out. But stimulus money cannot be given to a private developer already signed onto the deal because it would totally change the equation based upon which the developer bid to pay the public a low amount for the site. Used that way, the money would eliminate the risk developer assumed and constitute an award of enormous private benefit to the developer without bid. Would the current change in the economy resulting in the developer's default have made it possible at this point to switch over and have the government prepare the site, especially as time now seems to have borne out that this would have been the better way to proceed in the first place? Yes, the developer missing its payments presented precisely this valuable opportunity. BUT that is exactly what the administration elected NOT to do when, instead, it extended the developer’s rights to the 26 acres. Extending the developer’s rights seems consistent with a city administration bias, as exprssed by the adminstration itself, to bequeath extended monopoly rights to individual large developers for large swaths of acreage that they will have on an “unfolding” basis “across many years” and “economic cycles” no matter the “various economic conditions” encountered along the way. Why does the Bloomberg administration do this? Is there benefit to this particular administration’s making single large, unstructured and inchoate bequests that apply for decades going out, thus sidestepping multiple opportunities for bids and checkpoints on accountability going forward into the future? By their very nature these arrangements limit participation in ownership of the city only to the very largest developers, and the arrangement works out only if the very large developers happen to remain solvent for longer than many people’s careers. The density planned for Hudson Yards is only slightly more than the overall significant increase in density planned for a wide surrounding area. The amount of density in the works may not yet have caught the attention of all of Quinn’s constituents. Overall, there will be a continuous swath of density right across Manhattan over to and including the Solow project. (Send another valentine?) Extra increased density right over Hudson Yards is being pursued as a way of generating more proceeds from the sale of the site. The MTA is technically the seller of this public land and would receive those proceeds. Since the MTA is striving to put as much density on the site as possible, the proposed density mounds up and is greater directly over the Hudson Yards property being sold by the MTA than the property that surrounds it. 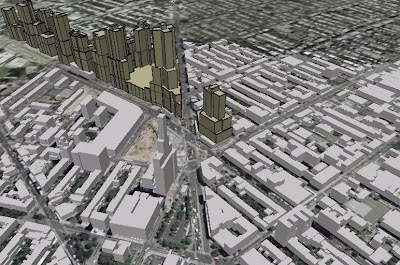 (The picture inserted here shows proposed density, not the density which now exists.) That doesn’t make optimal long-term urban planning sense since the density around the property closest to the extension of the #7 subway line winds up being less, although it is there that it should be relatively greater. The Chelsea Hudson Yards community should be sending a valentine to the Brooklyn neighborhoods that are having to contend with the shove-it-to-the-public efforts of the Atlantic Yards developer. 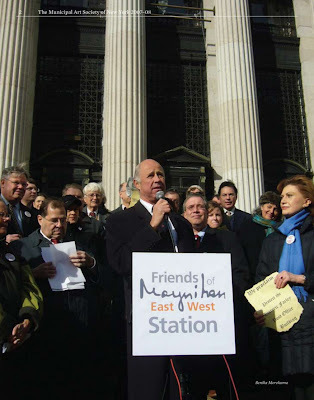 We have commented before that the Hudson Yards Community Advisory Committee letter on Hudson Yards reveals where Speaker Quinn and the others should stand on Atlantic Yards. We’ve noted the many parallels between the proposed Hudson Yards and Atlantic Yards projects so that criticisms of Hudson Yards, which is a relatively good project (a high density project in a high density neighborhood), also apply to Atlantic Yards. At the same time, all the ways in which Atlantic Yards is different from Hudson Yards make Atlantic Yards probably the Bloomberg administration’s worst “city-planning” escapade. Interestingly, one of the things that makes Atlantic Yards so much worse is that the MTA is NOT maximizing the sales price of the land it is selling. Rather than raise more money for capital or operating expenses, the MTA is selling its property to the Atlantic Yards developer at a substantial write-down and collecting far less (hundred’s of millions less) than it could. We could go on to talk about other things various of our city communities have in common. We could talk about communities that have to deal with misnomered “community benefit agreements” that are really rigged non-negotiations disguised as excuses not to provide benefit to the community. Communities such as Williamsburg and maybe even Union Square might want to submit arguments about where they fit in on this list and what their to-and-fro should be exchanging valentines with other communities. (We have a comments section.) There are other questionable rezonings to talk about, buildings and industries that are being carelessly lost. .
. . . We could go on and perhaps we should, but we think we have made our point. The individual communities across the city have their particular profound concerns about the way that development is done by the administration in this city. Those communities deal with and fight their fights individually and often don’t win fights they should win, but in a larger sense, the community concerns are concerns in common. The city is cutting deals, some of them intricate and clever, putting the interests of real estate developers first. Not all real estate developers, only the very big ones large enough to hobnob with the mayor. Strip things down to their core and you find that something is being sold. What is being sold is what belongs to public. Sometimes it is referred to as the “public realm.” That means such things as the right not to have our streets and avenues closed and sold off, the right to our historic neighborhoods, the right to good urban design, livable density and the right not to have our parks or amusement areas like Coney Island given away for development or speculative purchase. Real estate taxes should be paid by everyone, without special friends of the mayor being excused or allowed to intercept those moneys for their own private use and benefit. Subsidies which come out of the public’s general funds (once those taxes have been collected) should not be made special and piled on the mayor’s favorites. Government’s function should be to protect the public interest, not to sell off the public’s assets. Government functions should not be privatized and handed out to developers whose interest is adverse to the public. Eminent domain should be the public’s special and rarely used tool for those special public improvement the public itself creates and owns. It shouldn’t be handed out for private use by developers to enrich themselves however they chose by accumulating and owning more of the city. The city should stop creating artificial fiefdoms in neighborhood after neighborhood of the city where, through government intervention, the richest large and lumbering developers will hold an exclusive monopoly sway over vast acres and where, by consequence, we may have blight for decades as development languishes. The hole-in-the-neighborhood-heart that warrants so many understanding valentines. In conclusion, we suggest that mailboxes be watched for valentines that might be coming late. There is nothing wrong with that. We like the rule: “Better late than never.” We suggest that there may be a few neglected messages your community might want to be sending off even now. One way to start: Send a link to this article to someone in another community with a note explaining why you wanted to share it with them. Well! Valentine's Day at YOUR school is a lot more depressing than I remember at Brown Elementary! Talk about your toxic romances...!